Need a Sink Cutout in Corian? No Problem! True, full-scale Corian or other solid surface brand counters nearly always turn out best when certified fabricators and installers do the job. But as a do it yourself-er, you can produce a pretty good small solid surface countertop on your own for bathrooms, bars, or small kitchens. 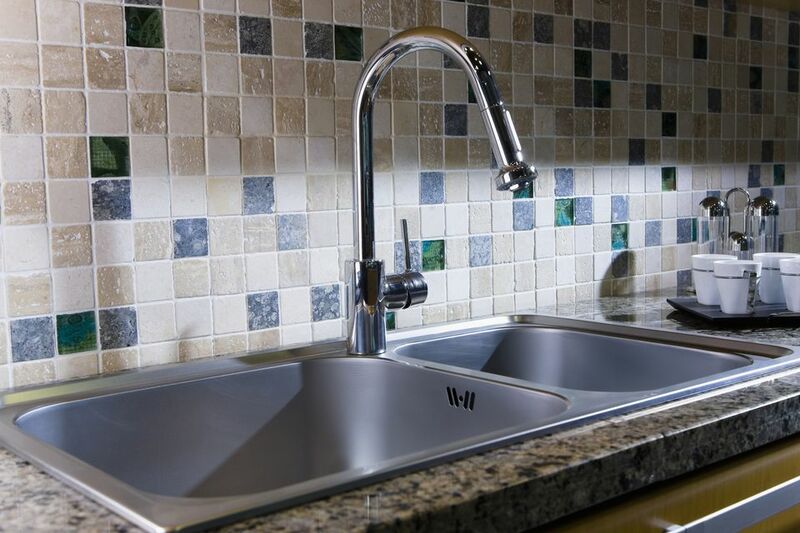 After you cut the material down to size, you will need to make a more complicated inside cut for your sink. With a little prep work, it is easy to make a cutout for a top-mount sink without special fabricators' tools or even without using a router. All you need are common shop tools and some patience. 1. Rotary Cutting Tool: Recommend a Roto-Zip or Ryobi 18V ONE + Speed Saw Rotary Cutter. The Roto Zip is corded; the Ryobi is cordless. Rotary cutting tools are not mentioned in the Corian Fabrication Manual as being a recommended tool, yet they will work for this purpose. Dupont (and all other makers of solid surface) recommend against tools, like jigsaws, that create excessive vibration. Rotary cutters and routers both have RPMs in excess of 20,000. 2. Extra Cutting Tool Blades: Besides slower cutting, the price you pay for using a rotary cutter is that you might run through two or three blades per sink cut out. 3. Cutting Guides: There are numerous ways to create a straight, rigid edge. One easy (but expensive) way is with metal cutting guides, such as the Empire 98-Inch Cutting Guide. But you can use any straight, rigid material. Lay the sink face-down on the solid surface. Draw an outline of the sink or, as shown here, mark off the outline with painter's tape. Be precise about this, as errors will become magnified with the next few steps. Once you have created the outside outline, you will need to create another outline. This second outline will be just inside the previous one. All sinks have different specs. With the 15" x 15" bar sink shown here, the inner outline should be 3/8" farther inward. Mark off this second, inner outline with painter's tape. Think of your sink cutout as happening in two phases: straight lines and corners. Cut straight lines first, corners second. Press 4 tabs of painter's tape down on each corner at a 45-degree angle. The purpose is to preserve this area for your future corner cuts. Because rotary cutting tools are drills, you can drill straight into the solid surface material. Drill two pilot holes per side. Rest your rotary cutter on the solid surface material, with the blade extended into one of the pilot holes. Place your guide track (fence) next to the rotary cutter. Clamp down the fence at this spot, with the fence touching the guard of the rotary cutter. Repeat for the second pilot hole on that intended line. Readjust the first clamp if necessary. Wear eye and hearing protection. A respirator is recommended, as melting solid surface gives off noxious fumes. Power on the rotary cutter. Move the cutter slowly along your fence, starting at one pilot hole and ending at the next one. Let the rotary cutter "tell you" how fast you can move; do not rush. With four lines cut, you now must cut the inside corners. Dupont recommends that the inside radius of your corner be no less than 3/16" (5 mm). You can trace this out with a coin or you can just eyeball it as you cut. Since the lip of the sink will cover the corners, appearance does not matter. After the last cut, the inside cutout will drop. If solid surface debris is clogging any of the cut lines, lightly run the rotary cutter through that line to remove the debris.